X High temperature transducer compensation resistors available in low TC and various high-TC versions using Evanohm, Balco, platinum, and nickel wires (see also the Joule description). Available in radial (black) and PC (red) lead configurations. X Custom designed shunt resistor with manganin resistor element and brass mounting blocks. Special shaped shunt with duel manganin wires, silicone/fiberglass insulating sleeve and specially shaped ring terminals. Application in the welding industry. X Special, qualified high-temperature 11-resistor network. Complete quality-controlled aerospace missile application requiring QCI testing on each production lot..
X Special temp-sensing resistor using a threaded brass bobbin with integral mounting screw head and high TC RediSeal wire (3500ppm/°C). X Special “banana plug” resistor used to configure a test board by easily adding or removing the resistor. X Showing various form shapes for the MSR low-ohm metal element product line. X Special joule–rated part with custom soldered, flexible lead terminations. Joule-rated parts are designed survival under high current or voltage spike applications (lightning strike, motor start-up etc.). X Custom thick film heater chip with special surface mount leads. Applications in the severeenvironment security camera industry to prevent fogging of the camera optics package. X Special fusible resistor with tight fusing characteristics, clear plastic housing and complete mil/aero qualification documentation for US missile project. X Precision resistor with screw terminal. High temperature transducer compensation resistors available in low TC and various high-TC versions using Evanohm, Balco, platinum, and nickel wires (see also the Joule description). Available in radial (black) and PC (red) lead configurations. Custom designed shunt resistor with manganin resistor element and brass mounting blocks. Special shaped shunt with duel manganin wires, silicone/fiberglass insulating sleeve and specially shaped ring terminals. Application in the welding industry. Special, qualified high-temperature 11-resistor network. Complete quality-controlled aerospace missile application requiring QCI testing on each production lot. Special temp-sensing resistor using a threaded brass bobbin with integral mounting screw head and high TC RediSeal wire (3500ppm/°C). Used in commercial oven (pizza) application. Custom designed wire wound gas flow sensor. The sensor is a precision tube with two platinum wire windings (TC = 3800ppm/°C). Applications in semiconductor production gas doping. 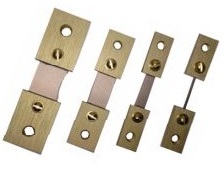 Showing various form shapes for the MSR low-ohm metal element product line. Special joule–rated part with custom soldered, flexible lead terminations. Joule-rated parts are designed survival under high current or voltage spike applications (lightning strike, motor start-up etc.). Custom thick film heater chip with special surface mount leads. Applications in the severeenvironment security camera industry to prevent fogging of the camera optics package. Special fusible resistor with tight fusing characteristics, clear plastic housing and complete mil/aero qualification documentation for US missile project. Duel precision resistor package with four leads. Let us do the search! Custom electronic devices often require precise custom resistive technology. Riedon has maintained its reputation for delivering the best in custom made resistive technology for decades. Their deliverability is timely, completed with optimal design and manufacturing. The need for custom resistors has been more widespread since technological devices are working to make every aspect of our lives easier every day. Small medical devices designed to pump insulin, start the heart or help someone breath need to be designed with the best technological solutions in mind. The same is true for aeronautical engineering tools that are designed for safety in travel in the commercial airline industry. The list of technological solutions requiring cutting edge solutions is seemingly endless. Riedon has been a trusted name in the resistor industry for decades and continues to create custom solutions for all resistor types. This includes solutions for wirewound resistors as well as thick and thin film or foil resistors. Specialized devices require specialty experience and design. Many factors need to be considered when the need for custom resistors arises. First, be sure to ask questions about how the custom resistors are manufactured and tested for optimal quality and performance. Additionally, experience matters, companies who have successfully designed custom resistors for specialized industries will have the knowledge and skill needed to get the job done right the first time. All parameters need to be considered when designing and implementing new technology. The experts with Riedon understand how to create what you need with all parameters considered and prime deadlines taken into consideration. For more information about the custom resistors that Riedon has developed in the past contact their team of experts today. Not all technology is created equal, make sure your device is in the hands of custom resistor design experts with Riedon and you won’t be disappointed.